So, instead I'm going to introduce an experiment I did while I was being homeschooled. A fun and easy one called the "Liquid Tower". *Blue words/numbers can be changed. 1) Heat some water in order to make the sugar dissolve easily. 2) Put the same amount of water into five identical bowls. 3) Mix any watercolor you like into each bowl. 4) Now put 3, 6, 9, 12 spoons of sugar into those bowls and don't mix anything to the last one - it's going to be at the top. Make sure the sugar has dissolved completely. 5) Divide the amount of water you want to put into the transparent cup into five. It would be the amount of each color level. 6) Now pour the most sugary liquid(amount is mentioned above) into the cup. Then carefully pour the next sugary one so that it wouldn't mix with the level below. Repeat these steps until you've finished making the liquid tower. 7) Your beautiful Liquid Tower is finished! This mini-experiment tells us that the liquid with more sugar is heavier. The sugar in each level of liquid decides the density, which makes it sink or float. This also explains why people can float in the Dead Sea. The water in the Dead Sea is so salty that it is higher in density than the human body. 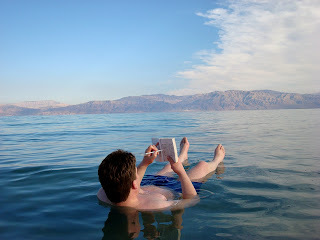 In the experiment, the Dead Sea would be the most sugary liquid, and people would be the less sugary liquids.